An unusual piece in this pattern. 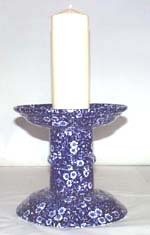 A small hexagonal candlestick in excellent condition. Fabulous candlestick on a square base with cut corners. Backstamp: Reg. No. 623294 This pattern was introduced by William Adams in 1780 being a copy of a Chinese pattern and one of the first of its style produced in English pottery. Wm Adams. Light all over crazing with a little minor wear to the rim of the sconce, otherwise excellent condition. Oh great joy to have a pair of candlesticks! These are an extremely handsome pair. One has some crazing inside the sconce and a hairline to the rim, it is also just slightly lighter and softer in colour than the other. The other has light crazing and the transfer is a little smudged to the base. All sounds far worse than it is! Base measures 5.75 ins across. With gilt. Very attractive candlestick with gilt highlights to the roses. Backstamp: Impressed Adams Tunstall. The gilt is very worn, to the rim of the base just a little damage and inside the sconce a little minor discolouration. Sounds awful, looks lovely! A stunning pair of large candlesticks printed in a steely blue. Backstamp: Warranted Staffordshire W A & S T England. There is a firing fault inside and a small chip and a little wear to the rim of the sconce. The pattern on the base is very blurred probably due to excess glaze. To the other candlestick there is a small hairline to the sconce and to the base there are a few lines of crazing, a couple of glazing faults and the pattern is also blurred. Oh dear this all sounds awful, but inspite of all they look pretty good on display! This is a gorgeous piece and has the added bonus of being complete with the candle snuffer. There is pretty printed decoration along the line of the handle. This has at some time been off but has been well repaired. There is light all over crazing otherwise this is superb. Blue printed Booths Silicon China, England. Fabulous pair of large candlesticks printed in a light steely blue. Backstamp: Booths Broads Pattern Silicon China. A little wear and discolouration to the inner rim of the sconce and just a little to the base. One stick also has light crazing. Overall a stunning and majestic pair. With gilt. Fabulous with elegant scroll handle. Sadly missing the snuffer. Backstamp: Booths Silicon China England Real Old Willow Light crazing, just a little wear to the gilt and a very small rim chip. Overall gorgeous! Provenance: The Entwistle Collection. With Gilt. Backstamp Booths Silicon China England Real Old Willow. Date of manufacture probably 1917-1920. Fabulous piece complete with snuffer. Light all over crazing and a couple of very minor hairlines underneath the saucer which do not go through. The snuffer has been broken into several pieces and has been restuck. Overall though a lovely piece. Provenance: The Entwistle Collection. With gilt. Fabulous candlesticks with embossed detail around the foot and printed dove detail to the sconce. Backstamp: Made in England. Excellent condition. With gilt. Oh what a joy! An absolutely gorgeous candlestick with elegant scroll handle and complete with snuffer. Backstamp: BurleighWare Willow Made in England. A little very minor wear to the gilt otherwise excellent condition. Made in England. Brand new and first quality. Blue Arden. Regal shape. This item has been discontinued by Burleigh and is no longer available. Made in England. Brand new and first quality, dishwasher and microwave safe. Hand decorated so each piece is unique. This item has been discontinued by Burleigh and is no longer available. Lovely column type candlestick on a square base. Backstamp: Cauldon England. Underneath there is a tiny firing fault otherwise excellent condition. Fabulous piece with deep round sconce and ornate side handle. Backstamp: Cauldon England. A little minor wear to the rim and inside a small very minor manufacturing fault, overall excellent condition. 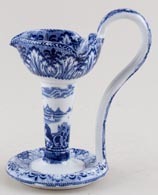 A fabulous chamber candlestick with elegant side handle. Backstamp: Cauldon England. There is a small chip underneath, otherwise excellent condition. This is a wonderful shape candlestick - the central sconce shielded by a moulded trefoil shape with a side handle. Backstamp: Cauldon England. Light all over crazing otherwise excellent condition. 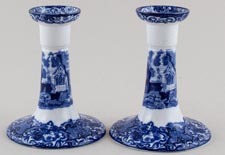 An absolutely delightful pair of small candlesticks, coloumn style on square base. Backstamp: Cauldon England. A little light crazing and inside one sconce a tiny red mark and a little surface scratching. Overall excellent condition. Fabulous candlestick with draught shield and side handle. Backstamp: Cauldon England. Excellent condition. 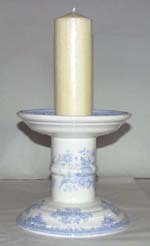 Two column type candlesticks on square bases. Backstamp: Cauldon England. Excellent condition. The sconce of one candlestick has two hairlines which run from the rim to inside the recess for the candle. The other candlestick also has two hairlines and two areas of restoration to the sconce, with some restoration also to the base. Sounds much worse than they look. The columns of these octagonal candlesticks are still bright and clean. This is a fabulous chamber candlestick with side handle. Backstamp: Cauldon Ware. There is a hairline to the sconce otherwise excellent condition. 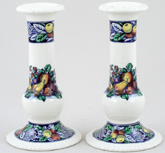 An extremely pretty pair of candlesticks decorated in a fruit and floral pattern. Backstamp: Royal Cauldon England Est 1774. Minor signs of wear, overall excellent condition. With gilt. A stunning candlestick in this gorgeous floral pattern inset with small bird vignettes. Backstamp: Doulton Burslem and impressed Doulton. Crazed with a little discolouration, mainly inside the sconce, a little wear to the gilt and to the foot a small firing fault. Sounds awful - looks lovely! Pretty pair of candlesticks, octagonal column standing on four small feet. Light crazing with a little association staining to the columns. As usual both sconces have suffered a little over the years and each has a couple of hairlines with discolouration. Very pretty floral decoration around the foot of the candlesticks and underneath the sconces. A lovely pair of candlesticks. 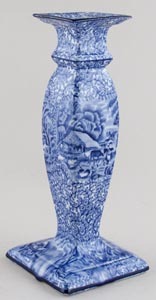 An absolutely gorgeous candlestick printed in a soft blue. There is a small firing fault inside the sconce that has resulted in a few lines of crazing, but this does not go through to the outside. Otherwise this is in excellent condition. With gilt. 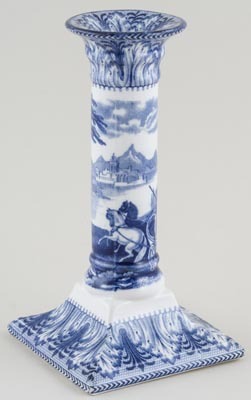 A lovely candlestick with a windmill scene printed in a lovely soft sky blue with a slightly darker blue to the border decoration. The rim border design is Alhambra pattern. Black printed backstamp: Grimwades Stoke on Trent England. There is a little wear to the gilt around the sconce otherwise excellent condition. Fine traditional English creamware as made originally in the 18th Century at the Leeds Pottery. Hand crafted using time honoured methods, including intricate pierced decoration, by skilled artisan potters at Hartley Greens & Co of Burslem. Brand new and first quality, dishwasher and microwave safe. Made in England. Hartley Greens have discontinued production and this item is no longer available. 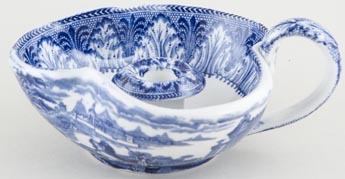 Derived from the Onion design, which originated at Meissen, the famous Blue Danube pattern was made in Japan on a porcelain body and was originally exclusive to Lipper International Inc of New York. Blue printed original ribbon backstamp Blue Danube Reg. U.S. Patt. Off. Excellent condition. Lovely single candlestick on a flared base. Backstamp: Abbey 1790. Light all over crazing otherwise excellent condition. A wonderful pair of candlesticks on flared bases. Backstamp: Abbey 1790 England George Jones & Sons. A little minor discolouration inside the sconce and just a little wear underneath, overall excellent condition. A candlestick in George Jone's Abbey is rarely found these days. An original pair, that started out life together, in good condition is much rarer! These sticks have good clear prints in dark blue, with only the occasional smudge or hazy bit. They have a lovely clear glaze, almost pearly. The inner rims of the sconces are decorated with the border design. Inside one of the sconces is a minor stress crack, which occurred during firing. There are a few lines of craze to the glaze. Otherwise these sticks are like new. Both have the earlier blue printed backstamp Abbey 1790 within a cartouche. 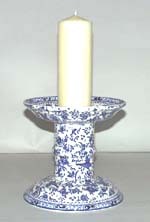 Fabulous pair of flow blue floral candlesticks. Backstamp: Regd No 595146 (partly missing). Excellent condition. With gilt. Gorgeous candlestick with gilt rim and gilt spatter decoration. No backstamp. Crazed otherwise excellent condition. With gilt. Two delightful candlesticks. No backstamp. The gilt is a little worn and one has a little minor discolouration to the base, overall excellent condition. 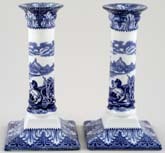 Elegant pair of chamber sticks from a dressing table set. Made by Keeling & Co in their Losol Ware. The pattern name has not been identified, but it is pattern number 4381. No backstamp, but 4381 in script on one stick. Superb condition. Wonderful large candlestick in this fabulous blue and gilt chinoiserie pattern. Backstamp: J Kent Ltd Ye Old Foley Ware Fenton England. Light all over crazing otherwise excellent condition. Very pretty pair of small candlesticks from a dressing table set. Backstamp: J Kent Ltd Made in Gt Britain The Chintz Collection. Tiny firing fault underneath one candlestick otherwise excellent condition. Stunning candlestick with convex column standing on square base. Different rural scenes eitherside of the column and on the base. Backstamp: J Kent Ltd Fenton England Ye Olde Foley Ware. Light crazing and it leans slightly, otherwise excellent condition. Stunning candlestick with convex column standing on square base. Different rural scenes eitherside of the column and on the base. Backstamp: J Kent Ltd Fenton England Ye Olde Foley Ware. A little light crazing otherwise excellent condition. James Kent. This is a most ornate candlestick - one of the lovliest we have seen. There is some discreet restoration to the rim of the sconce and some light crazing otherwise this is superb. 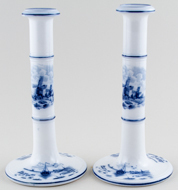 Pair of octagonal candlesticks in this lovely chinoiserie design. Although a pair one is approximately 0.25 ins smaller (size given below the larger!) The smaller one is in excellent condition. The larger has just a touch of light crazing and a small restoration to the rim of sconce. Blue printed backstamp Mason's Patent Ironstone China England. Woodland is also known as Farmyard pattern. Beautiful small candlestick in lovely condition. 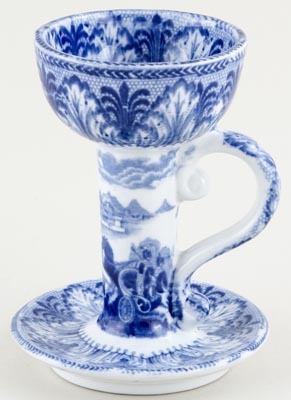 Typical blue printed backstamp Masons Patent Ironstone China with crown and curtain. 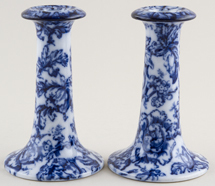 Fabulous pair of candlesticks printed in a soft blue. Backstamp: Mintons Est 1793. Minor wear to the rim of the sconce, but overall in excellent condition. Designed by Sophie Conran for modern living, this oven to tableware collection looks as good on the table as it is useful in the kitchen and has won the ELLE Decoration Award for Best in kitchens. Ideal for a relaxed lunch or formal dinner party. Brand new and first quality china, which is dishwasher, microwave, oven and freezer safe. This item has been discontinued by Spode and is no longer available.